Weather Assessment for the First Dekad (1st–10th) of April, 2019. On days: 3rd, 4th and 6th, Trinidad and Tobago experienced some useful rainfall that assisted in moistening soils and rejuvenating crops and vegetation. Preliminary results of rainfall amounts for Trinidad, showed that north-eastern and eastern areas had rainfall totals as follows: Piarco (5.7 mm), Cumaca (0.0 mm) and Sangre Grande (37.4 mm) were mostly within the forecasted range of 0.0 mm to 10.0 mm. Similarly, northern areas such as Caura (5.5 mm) and St Anns (2.0 mm) had rainfall amounts within the range 0.0 mm to 10.0 mm. Additionally, north-western areas of Trinidad such as Moka (0.2 mm) and Diamond Vale (0.0 mm) were within expected range of 0.0 mm to 10.0 mm. However, central areas had rainfall totals as follows: Flanagin Town (12.8 mm), Navet (17.0 mm), Tamana (34.4 mm), which were mostly above the range forecasted of 0.0 mm to 10.0 mm. Similarly, southern areas had the following rainfall amounts: Point Fortin (15.2 mm), Barrackpore (9.6 mm), CatsHill (21.0 mm) and Guayaguayare (15.2 mm), mostly above the range forecasted of 0.0 mm to 10.0 mm. 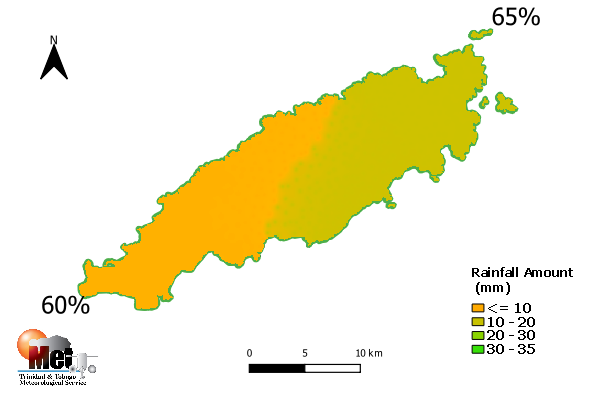 Tobago had experienced some rainfall, western areas such as Crown Point had rainfall totals around 6.3 mm, within the forecasted amount of 0.0 mm to 10.0 mm. Trinidad’s temperature was generally inside of the expected range, the maximum temperature went up to 32.6 0C, which was within the expected high range of 32.4 0C to 33.5 0C. At the same time Tobago’s maximum got up to 31.4 0C, within the expected high range of 30.9 0C to 31.8 0C. Similarly, lowest temperatures recorded were 21.8 0C in Trinidad and 22.0 0C in Tobago. In Trinidad’s case, the minimum temperature was within the expected minimum range of 22.9 0C to 21.5 0C. However, the minimum temperature was below the expected minimum range of 24.0 0C to 22.6 0C for Tobago. 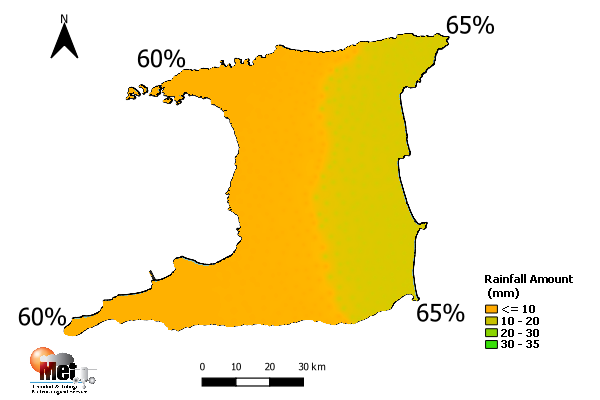 The average humidity Tobago remained in the upper sixties to low seventies while Trinidad’s average humidity remained in the low to medium seventies, throughout the dekad. Expected Weather for Second Dekad (11th – 20th) of April 2019 and Likely Impact on Agriculture. The forecast for the second dekad of April indicates that farmers can expect similarly dry conditions as compared to the first dekad of April, 2019. But relatively wet days: on 12th, 13th, 14th and 15th; with relatively dry days: 11th, 16th, 17th, 18th, 1 9th and 20th. During relatively wet days, expect during early morning or late afternoon patchy cloudiness with light rainfall over some areas; while during relatively dry days, expect few cloudy patches. The ten-day period rainfall totals, forecast to range between 10.0 mm and 20.0 mm in Trinidad and between 10.0 mm and 15.0 mm Tobago. The average daily temperatures across Trinidad and Tobago are likely to range between 27.3 0C and 27.8 0C. Expect the highest maximum temperature over the dekad to peak near 33.7 0C in Trinidad, while the lowest night to early morning minimum temperature could dip below 21.9 0C. Especially along the foothills and valleys during relatively cloud-free nights. Likewise, during the dekad, in Tobago, the highest maximum temperature will peak near 31.9 0C, while the lowest minimum temperature will dip below 22.7 0C, mostly during relatively cloud-free nights. For both Trinidad and Tobago, the daytime relative humidity (RH) is likely to range between 62% and 67%. However, during relatively wet days, RH percentage values will range around 67% to 78%. At the same time, wind speeds are expected to range between 30 km/h and 55 km/h but can gust to 60 km/h. In addition, evaporation rates are expected to range between 9.0 mm/day and 15.0 mm/day. There is also a moderate (80%) probability of visitation of Saharan dust/haze that will occasionally reduce visibility to less than 10.0 km, particularly during days: 12th, 13th, 14th and 15th. Due to the existing conditions (dry season) at the is time, more frequent irrigation may be warranted during the dekad. Additionally, the combination of winds, dry vegetation/foliage and hot conditions, there is a high probability (80%) of an increase frequency of bush and forest fires at this time. Farmer should be more vigilant to protect, crops, livestock and property at this time. The sun is presently at a latitude approximately 7.5 degrees’ north latitude, and with this position, the day length for this dekad will be 12.2 to 12.3 hours. The intense solar irradiance episodes will start becoming more frequent during this dekad when the sky is generally cloud free. There is medium probability (50%) of heat stress on certain variety plant seedlings and animals from direct exposure to solar radiation and high temperatures. Additionally, the first quarter moon phase will be on the 12th, followed by its full moon phase on the 19th.This may result in medium to high moonlight over crop fields and livestock. As the sun sets in the west, planets: Mars, Jupiter and Saturn will be seen in the evening sky.